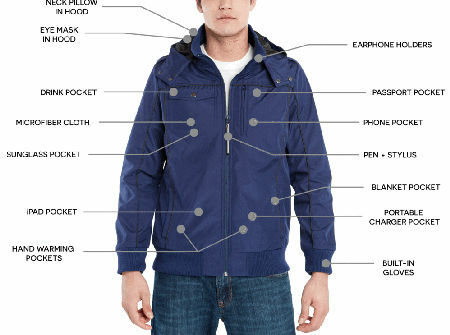 A modern travel friendly Bomber Jacket with a stylish flair with 15 FEATURES. A jacket that can take you from a party setting to the casual ski mountains in high style. After years of frequent traveling for both work and leisure, our founders have experienced their fair share of travel inconveniences. They tried everything from packing efficiently to experimenting with 9 travel pillows in less than 3 months’ time— all of which still left them frustrated. So, they sat down together and brain-stormed their way to a travel jacket which had 15 features that solved the problems many travelers experience today. In the Summer of 2015, they launched a Kickstarter to fund this idea. Thousands of people all over the world backed the project— leading it to be the most funded clothing project in the history of crowdfunding. Now, our company is continuing to improve our clothing line in addition to working on new products to solve more of the problems facing frequent travelers. Shipping and handling is FREE within the 48 continental United States. An additional fee of $25.00 will apply for delivery to Hawaii, Alaska, Puerto Rico and Canada. We will be unable to accommodate deliveries to any other international destinations.